■. Mini-shelter includes power system cabinet, power system, AC/DC distribution unit, monitor unit, and heater, distribution cables,battery and sensors are optional. ■. Heater: it is optional, and it is used in cold areas. ■.Distribution cables: ODF and DDF are optional. ■. Monitor unit: ETP48200A with SMU02B monitor module, battery temperature sensor, environment temperature and humidity sensor, smoke sensor and water sensor, and so on. ■. Battery: the type of battery is determined by load and the backup time. Using a heat exchanger as the temperature control element cooling equipment, the use of air inside and outside completely isolated, radiation heat transfer through the heat exchanger core from each other. The heat exchanger should be selected according to the selection of heat inside the outdoor power enclosure to outdoor equipment. 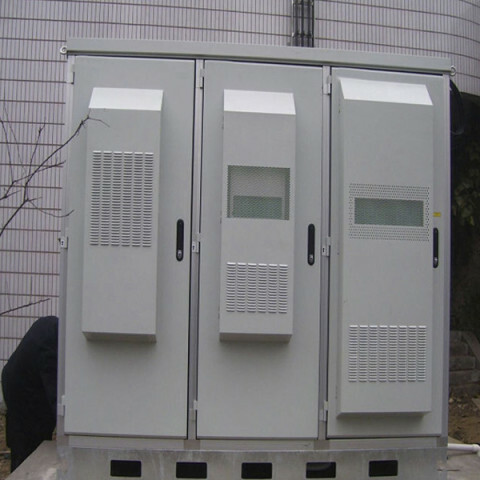 Using semiconductor devices a way of active cooling to the temperature inside the outdoor network enclosure, considering outdoor harsh conditions, the semiconductor refrigeration compressor to provide reliability without refrigeration system. The thermostatic outdoor power enclosure in China Unicom, mobile, telecom operators have been widely applied in centralized procurement.